I’ve said it before and I’ll happily say it again – Tomatin Distillery is one of my favourite whisky producers at the moment. I first stumbled across the distillery at 2012’s Whisky Fringe and I’ve been a big fan ever since. The team at Tomatin has created some smashing whiskies over the years, which crucially, have a price point that won’t break the bank. I’ve usually always got a bottle of the Tomatin Legacy in the house, which is an absolute steal at under £30. Last month, the distillery unveiled a raft of new releases in the form of the Five Virtues. Each of the five whiskies draws its inspiration from nature’s elements – Wood, Fore, Earthy, Metal and Water – and the packing is uniquely adorned with works from contemporary Scottish artist, Evan Ullrich. Each of the five releases is limited to just 6,000 bottles, with a promise that each has its own “distinct complexity and character”. Earth, Metal and Water will be released later this year, but Wood and Fire have already hit the market, and I’ve managed to snaffle myself a sample of each. The first of the Five Virtues really lives up to its name, as it is comprised of whiskies which have been matured in selected French, American and Hungarian oak casks. I got loads of orange on the nose of this one – dried oranges, orange oil, fizzy orange pick’n’mix sweets – all tied together with gentle oaky spices, and a slight hint of white chocolate. There’s a burst of orange on the palate too, with a bit of lemon muscling its way in. Brown sugar brings a sweet, caramel dimension, with vanilla and more warming spices. Another expression which lives up to its name, the Fire Edition has been matured in heavily charred oak casks which, having been fired before previous use, were stripped then re-fired stimulating new, fresh vanilla flavours. And boy, does that vanilla come through on the nose! There’s a creamy caramel too, along with lighter orange, a tiny bit of apple and some gentle nutmeg. Creamy vanilla slips over the palate, with burnt brown sugar and a touch of cinnamon. 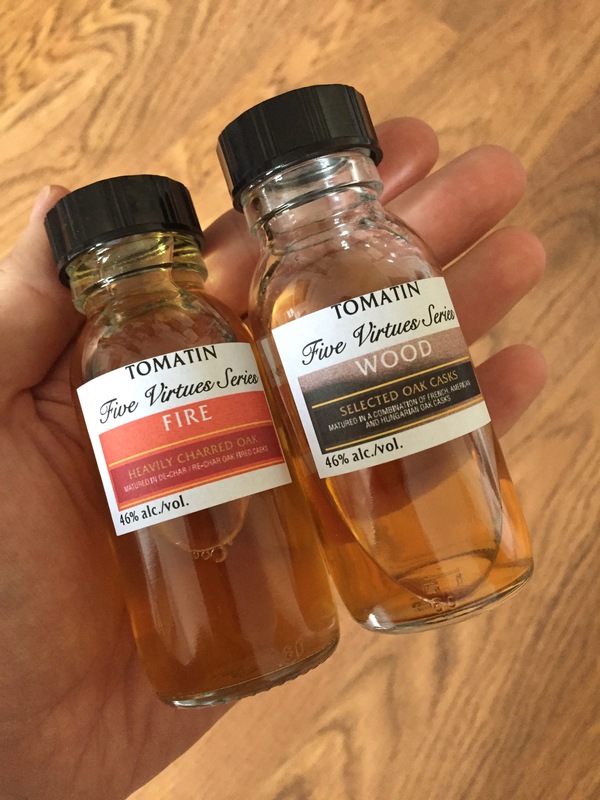 By their powers combined (I’ll let the geeky reference sink in) this pair make a great edition to the Tomatin range. And my appetite has been well and truly whetted for the other releases later in 2017. Both Wood and Fire are available from £49.99. 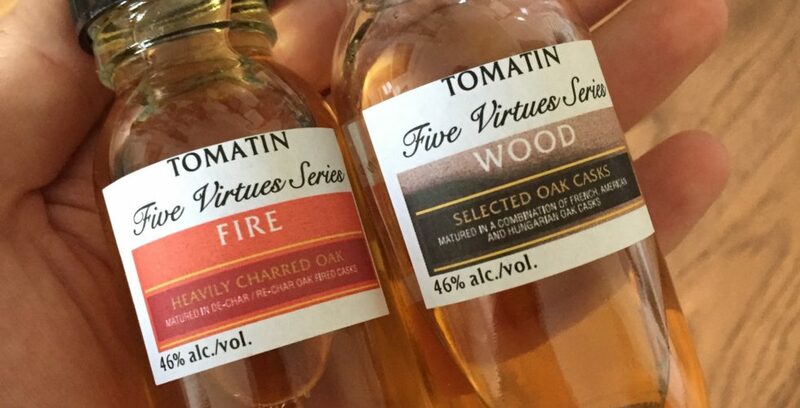 More information can be found about the Tomatin Five Virtues on the distillery’s website. My samples were provided by Tomatin.